Proud winner of 7 awards at the British Travel Awards! 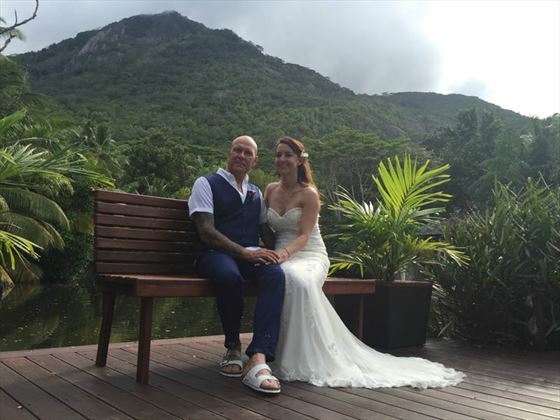 "We wanted to send you and all the team at Tropical Sky a massive thank you for all your help and advice in arranging and booking the most incredible wedding and holiday. It far exceeded all our expectations!!! The location, staff, food and every small detail was perfect, with nothing being too much trouble. All of us agreed 100% that nothing could have improved our stay, the only downside was having to leave! Thanks once again for all your help and support, in making our wedding just perfect!" "We wanted the wedding to be about us and our love and our lives, instead of debating with our family and friends about guest lists, flowers, wedding presents and a million other things that aren't a priority in our lives. Tropical Sky were extremely helpful! From the first email I sent enquiring about travel arrangements to the last email from them wishing us a lovely wedding, I couldn’t have asked for better service. "Well we are back from Kuredu and had a truly amazing time. The renewal was amazing and everything we dreamed off. I'd like to thank you and Amanda for all your help with booking this and answering all my questions. Hopefully we will be returning to Kuredu for our third visit and anniversary next year so I'll be in touch for a quote soon. Once again many thanks for helping make our dream wedding come true. 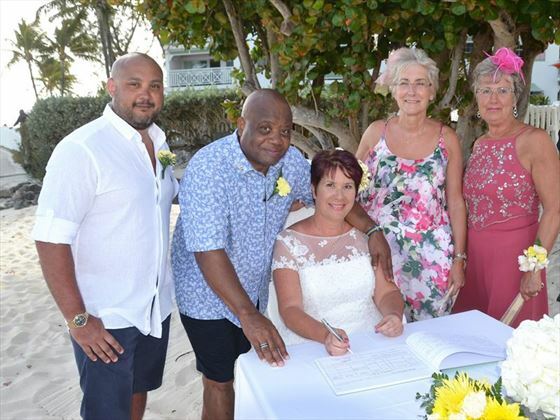 "We usually go to Barbados every year, so it made sense to have our wedding there, where there is guaranteed sunshine, and my relatives could also enjoy a lovely holiday at the same time. Tropical Sky were very helpful, would highly recommend them." "We used Tropical Sky and Karen, for our options. I had an idea of how I wanted it to be and Karen put everything in place with the resort. Tropical Sky & Karen were amazing, she let us know what was possible and what wasn’t. It was brilliant. 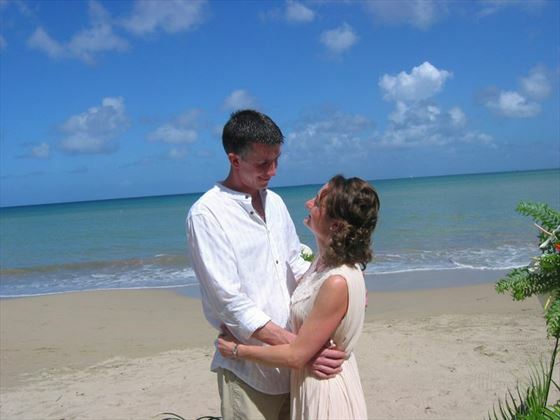 "Thanks for all your help organising our wedding in Antigua. 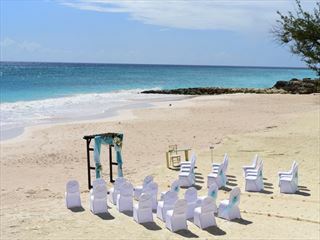 We had an amazing time at the Galley Bay." 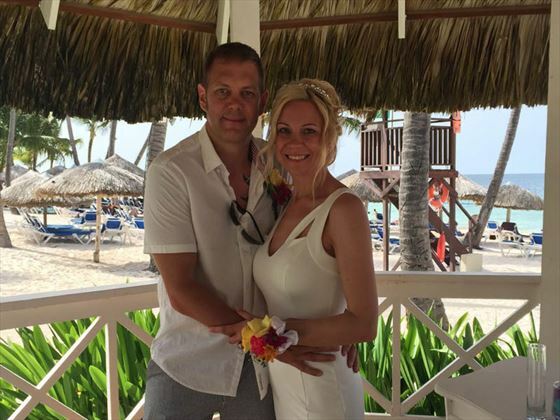 "We wanted to drop you a quick email to say a massive thank you for all your help with our wedding plans. From the moment we got to Gatwick with the wedding dress box to getting home yesterday the whole process was so easy and fun to do. We will remember this event forever and will always recommend you and Tropical Sky to our friends. We look forward to booking our next adventure with you in the future. Thank you once again. 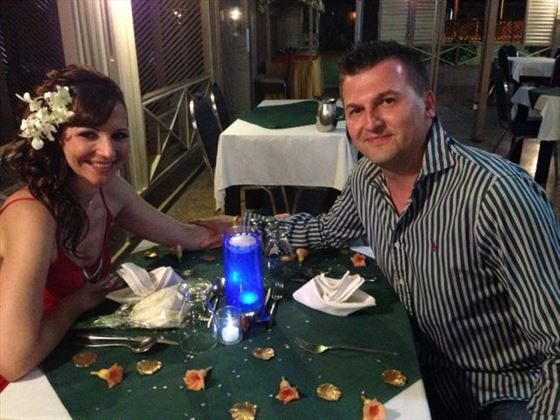 "Kieran & Karen at Tropical Sky did a brilliant job organising all the guests’ accommodation and requirements. The support from day 1 until our return to the UK was just superb. Tropical Sky were extremely helpful. We were very happy with their service." 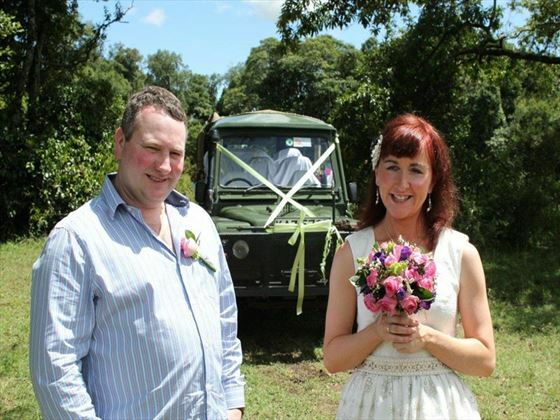 "Everything went really well with our wedding. 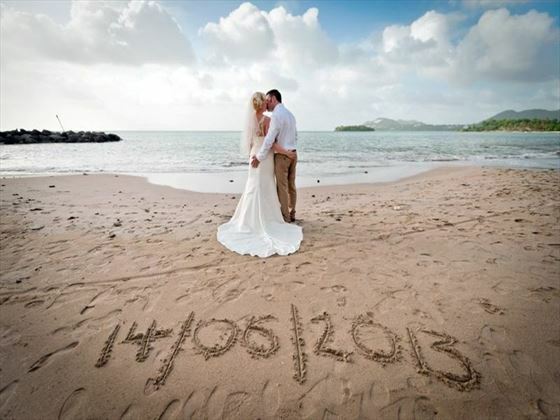 Sugar Bay was fantastic and we want to say thank you for all your help with the preparation of our special day." "What made you decide to get married overseas rather than the UK? ... After many years in a relationship we decided to keep it quiet and to create a secret about our wedding day." "The wedding was perfect - sounds cheesy but it was everything I had dreamed of and more... After seeing all my girls the day before at my bridal shower I was thinking have I done the right thing doing it without them and our families but now we've done it, we wouldn't change one thing. We were so relaxed and at ease all day, it felt really special & romantic. I cannot thank you enough for all your help, you have been incredible!" 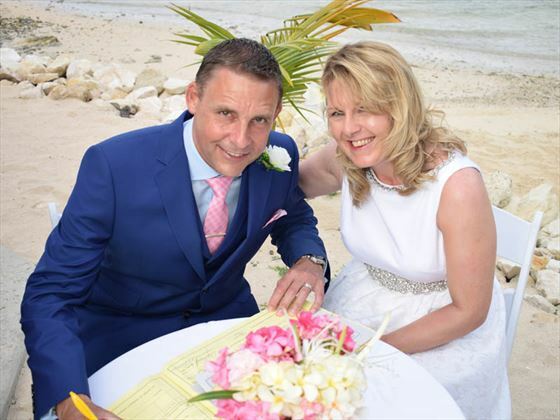 "When we decided to book our wedding abroad, Tropical Sky came up tops with ease of booking and professionalism from our first point of contact right through to the end. Helpful to the point we didn’t have to worry or even stress about the wedding. To be by the pool in the pool and even the sea a few hours before the wedding ceremony shows how organised Tropical sky are. 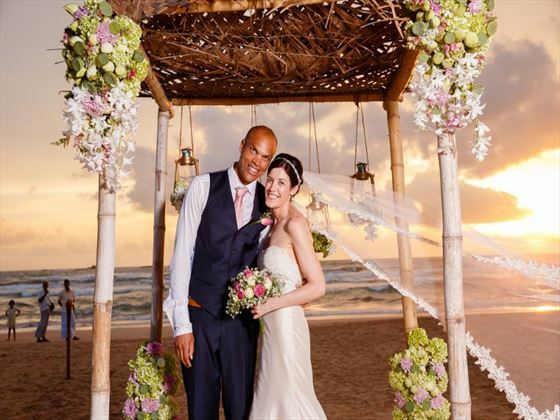 I would recommend to anybody wanting to get married abroad to use them." 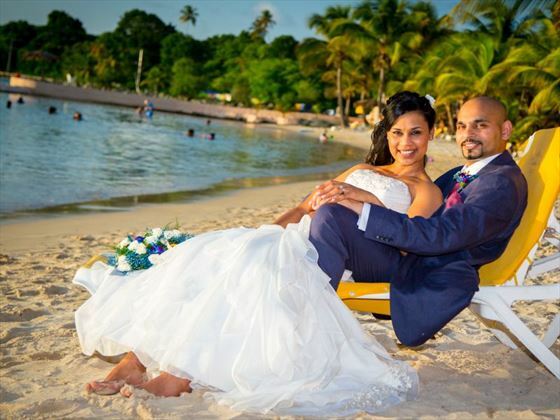 "We were married in the gorgeous beach gazebo at the Coconut Bay Beach Resort & Spa, St Lucia. It was amazing. Thank you." "I wanted to take this opportunity to thank you for all of your help with the planning of our wedding. We had an absolutely amazing day and have lots of great memories. "My best memory was when I saw Dan for the first time after I was all dressed up and seeing his reaction to how I looked. I felt like a princess!" 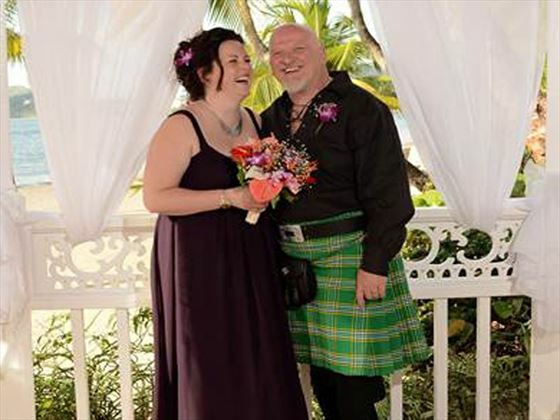 "We had both been married before and we didn’t want to go through all the planning, involve families etc. This was just about the two of us and nobody else. We both love the sun and wanted somewhere lovely and sunny and hot. Tropical Sky organised everything with the hotel. They even told us the dates we could get married on. The only thing we had to worry about was what type of cake we wanted with our package. 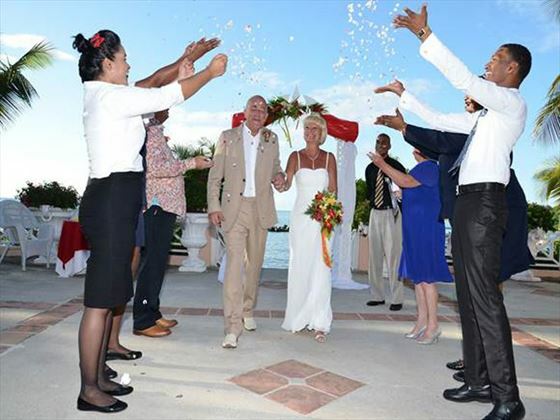 We obviously had questions regarding the ceremony but everything was perfect." 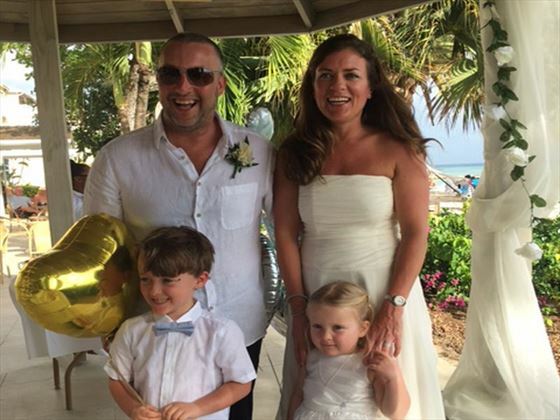 "Just a wee word to say thank you, we had a lovely time, and the wedding was amazing! Thanks again for all your help." 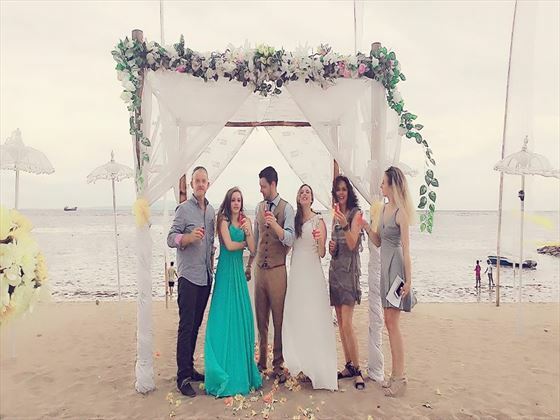 "Everything was planned by Tropical Sky, they took care of all of the arrangements and hotel transfers – it couldn’t have been more straightforward. We had the most perfect day." 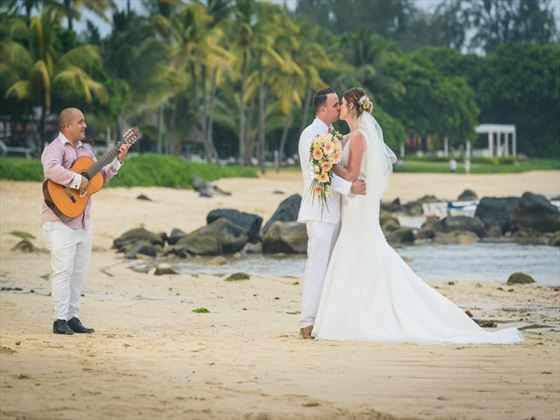 "Everything was a million times better than we’d hoped for – without Tropical Sky, our perfect paradise wedding wouldn’t have been possible!" 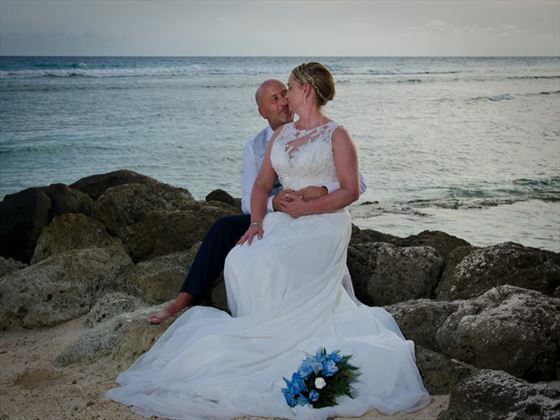 "We just wanted to say thank you for an absolutely amazing time – our wedding was perfect and we will always recommend Tropical Sky to family and friends in the future." "I can’t say thank you enough! 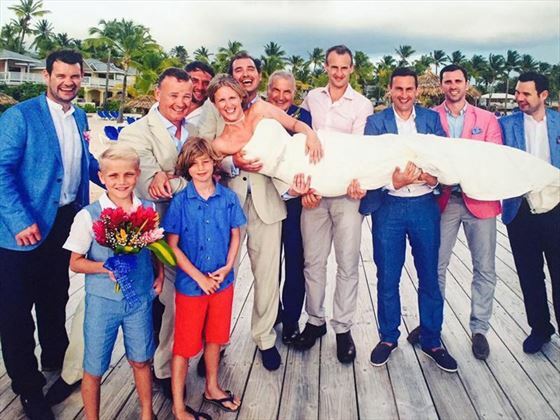 It was an epic experience – the whole wedding was amazing. I’ll make sure we recommend you to all of our friends!" 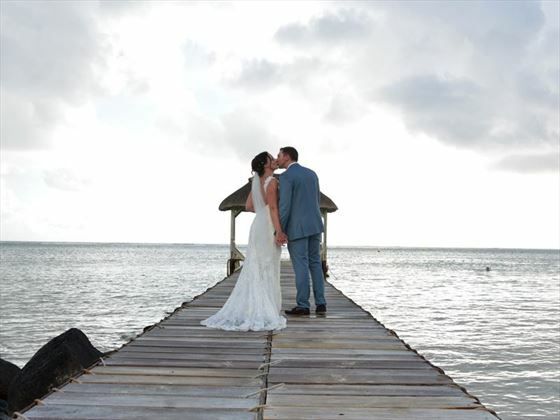 "The wedding was absolutely beautiful, and the weather and atmosphere were just perfect!" "After researching hotels, Spice Island won it for us easily! 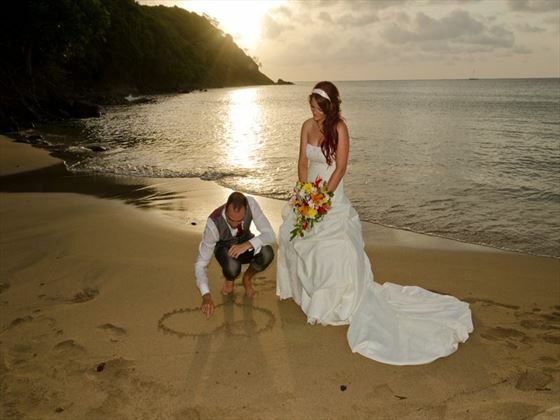 The island of Grenada looked beautiful and had so much to do – Tropical Sky sorted everything out perfectly for us. " "It really was an amazing week and we want to thank you so, so much! We would certainly recommend the hotel and, of course, Tropical Sky!" "I received really great customer service from Tropical Sky and found everyone really helpful, friendly and efficient. 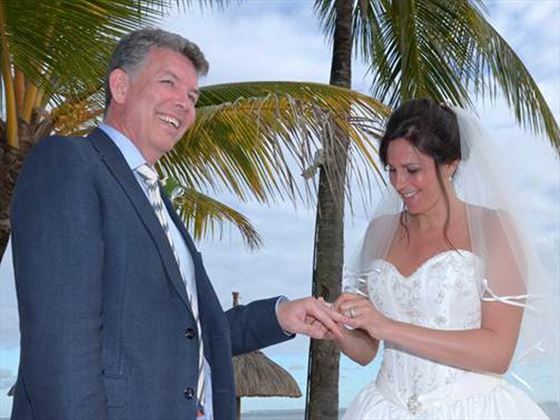 It was great to know everything was under control, and the holiday and wedding went really smoothly - we'd definitely recommend Tropical Sky to anyone in the future! 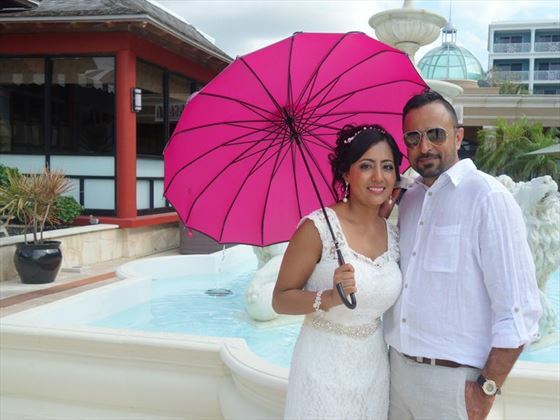 "The wedding team at Tropical Sky organised almost everything and the attention to detail was impressive. It was the best week of our lives. " 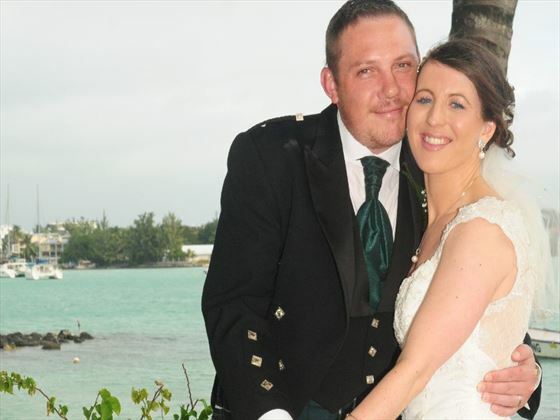 "We had a lovely holiday and all went well on our wedding day. Thank you to Tropical Sky!" 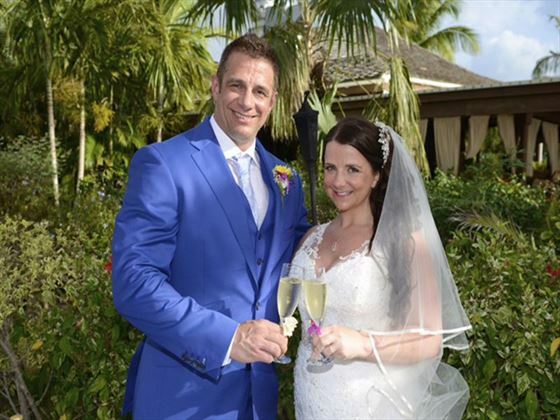 "What an absolutely AMAZING, out of this world wedding and honeymoon we have had. I just wanted to say a massive thank you to you for all of your help and hard work in getting us exactly what we wanted for our wedding. I literally could not be happier!" 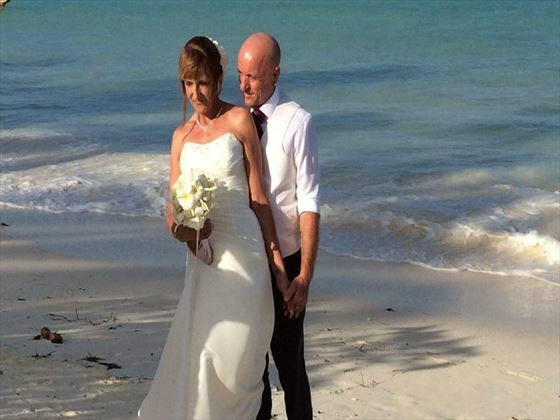 Mr & Mrs Hanley GingerMarried in Antigua with a stunning ceremony at Galley Bay! 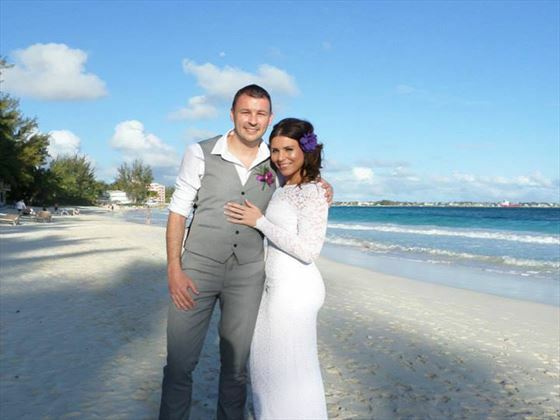 "Karen Andrews and Jordan Forbes were instrumental in organising everything for our trip. Everything was absolutely fantastic and ran so smoothly. 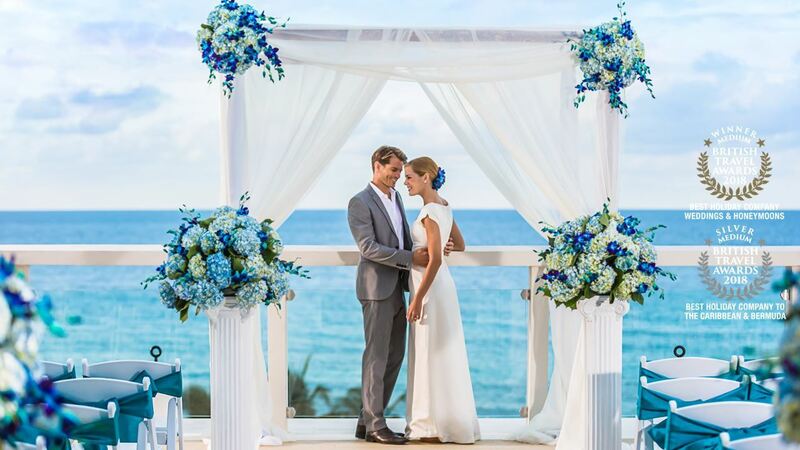 No question was ever too small for the Tropical Sky Weddings team and they were always quick to respond - exactly what you need when trusting someone with your most special day. 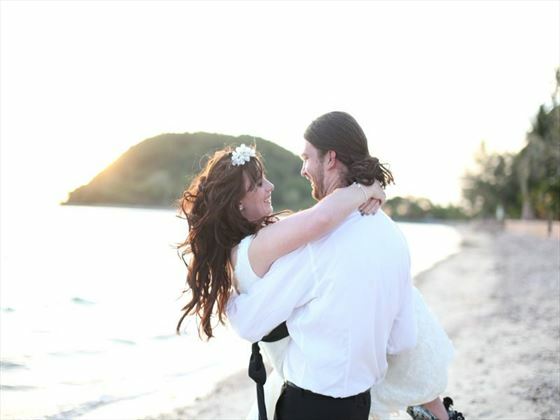 We would highly recommend Tropical Sky - it was better than we ever imagined!" 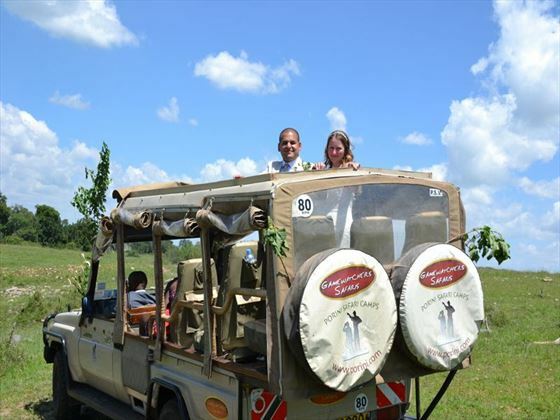 "The whole day was perfect; everyone was professional, friendly and the hospitality we received was fantastic! " "Dear Paula. Well we did it! 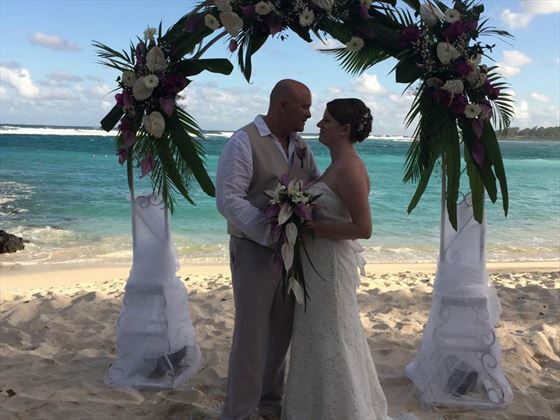 Got married in the Bahamas and it was amazing. I wanted to thank you for all your help and wanted to share some pictures with you!" "What was your best memory? … When the Registrar asked Matthew if he would take me as his wife and his reply was “Absolutely” ! Funniest memories? … Getting into the hotel pool in our wedding outfits! "A unique & memorable wedding at Governors Camp, Maasai Mara National Reserve"
"A beautiful wedding at the Coconut Bay Beach Resort & Spa, St Lucia"
"We had a wonderful time at the Tamassa and the Wedding was amazing despite the rain on the day! It stopped as soon as I made my entrance and didn't start again. 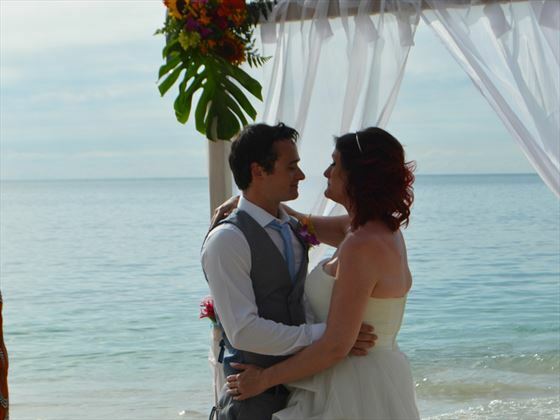 Thank you Tropical Sky for making this a very special Wedding and holiday. 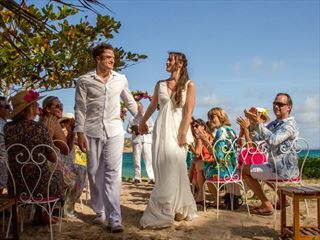 "Beautiful beach wedding at the Rendezvous, St Lucia"
"We would like to express our sincere gratitude to all of you for helping to plan what can only be described as the most unforgettable and memorable time that we have shared. The wedding, location, photographs, flowers and weather was just perfect, it couldn't have been planned any better. 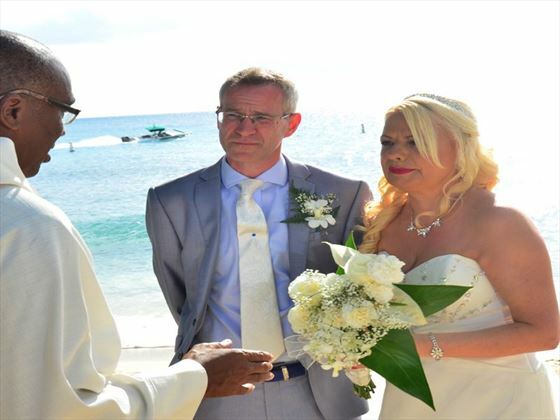 It also goes without saying, that if it wasn't for the help and support we received from you guys then I am sure with a high degree of probability we would have left Barbados with a hint of disappointment. " 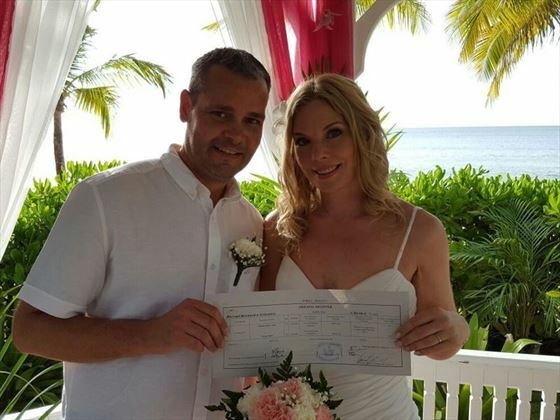 "Just to say thank you for booking our wedding in Tobago, we had a fantastic time and the perfect day at Coco Reef, Tobago. Janelle our wedding co-ordinator did a fantastic job for us. The hotel is superb, no complaints at all, and the staff are all so very friendly and nice. 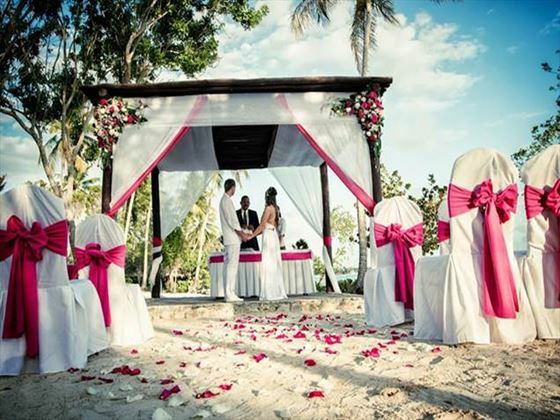 We would certainly recommend the hotel and encourage more people to get married there! Tobago is an amazing place." 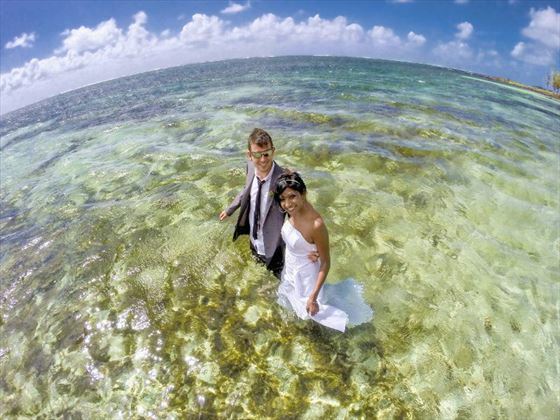 "Between both Fred and Rishini, they helped plan our perfect day. Fred was able to answer all our questions and pre-arrange everything. Rishini then took over when we arrived on holiday. Tropical Sky made all the parties travel arrangements and Lynn Delgado was our contact for the group who did a very good job juggling the requests of the party." "Jambo from Zanzibar. 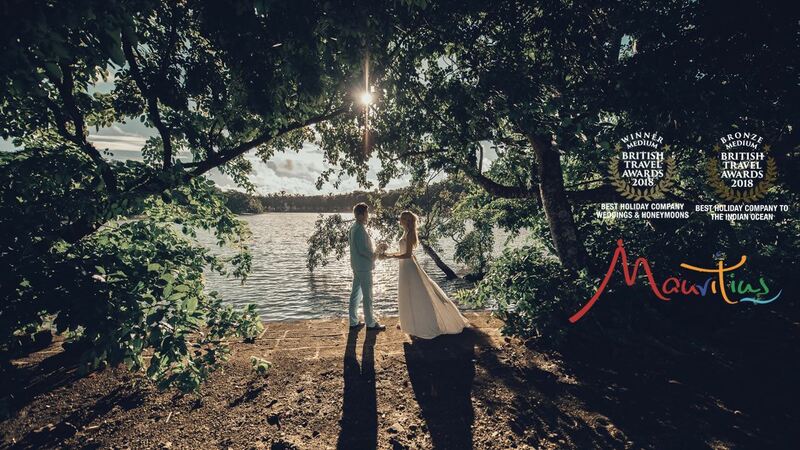 What a truly perfect day we had in the most beautiful setting. Many thanks for everything. Jane and Paul. "The Rendezvous wedding co-ordination was first class. I have done trip advisor etc. I must say you handled everything brilliantly. The reason we went with you lot was you. When I spoke to you on the phone I immediately felt like you cared and were professional. Some of your competitors sounded as if they didn't give a tinkers. Seems my intuition was right. 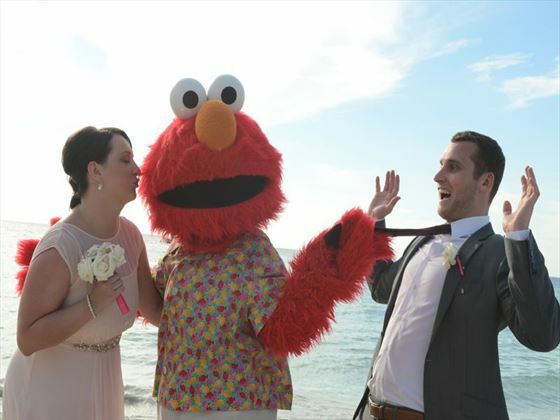 We sure do have lasting memories of a fantastic wedding and honeymoon. " 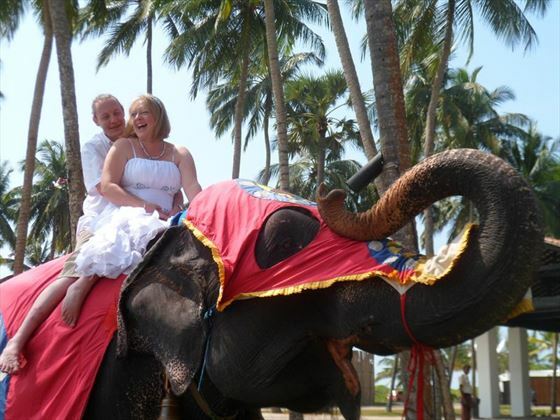 "What a fabulous holiday, wedding and honeymoon!!!!!!!!!! Thank you for helping my husband to organise the trip. Karen was extremely helpful, especially the day before we came away. My dress would not fit in to the box and she took charge of it all. We got it over!!" "We could not have wished for a better place/time and staff. Whatever we wanted and asked, they arranged and booked, every detail was well-organised, everything was on time, everybody was warm, nice and so friendly...so when our time came we felt ourselves "at home"!!!! Here we were in very good hands, we felt ourselves special and precious. We are very happy that we have booked with Tropical Sky!" 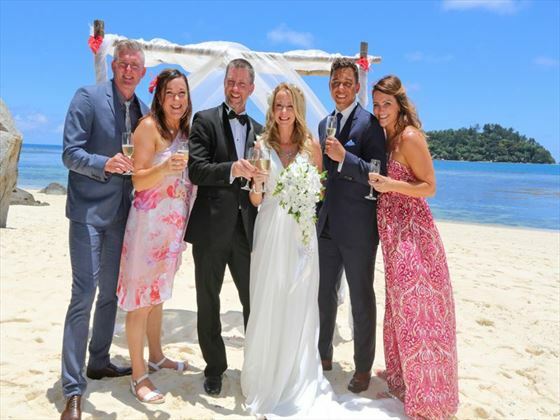 "We had a fantastic wedding with family & friends at Porini Lion Camp"
the hotel pulled out all the stops for our wedding ! 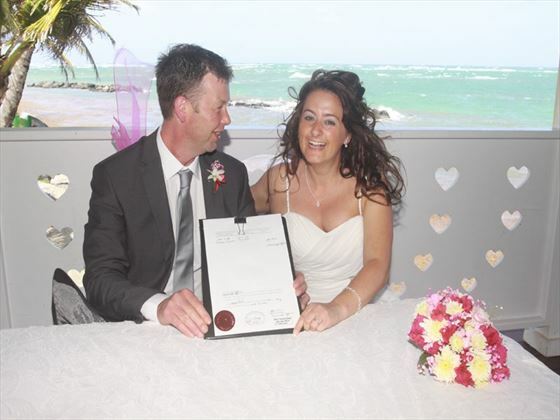 "It was difficult for us to get all documents sorted but Karen Andrews, our wedding coordinator in the UK helped us in the main moment when we nearly lost our hope that we can assemble all documents. But we did it and are very grateful to her. "Tropical Sky were great. Did everything for us and were very helpful. Joel and Karen the wedding co-ordinator made the whole planning of holiday and wedding much easier. 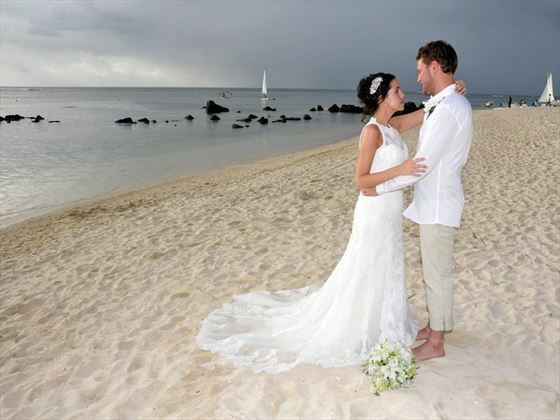 "As long as I can remember I was dreaming that my wedding would take place somewhere on a white sand beach. And I met a guy with the exactly same dream. We have always had the same mind and we always knew we would do it in a different way, so a big fancy wedding was not for us! We wanted a romantic, lovely wedding just for the two of us. And we chose Mauritius. 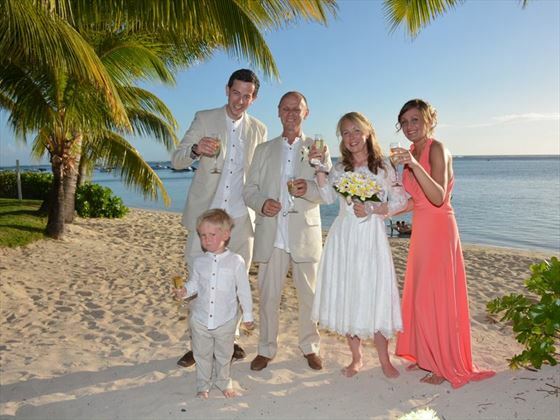 We had a wedding co-ordinator, Madhavi in Mauritius and Jackie Sheehan and Karen Andrews in Ireland. These ladies did a perfect job." "The whole day was an amazing unforgettable experience and neither of us can pinpoint any particular moment, it was all absolutely stunning." 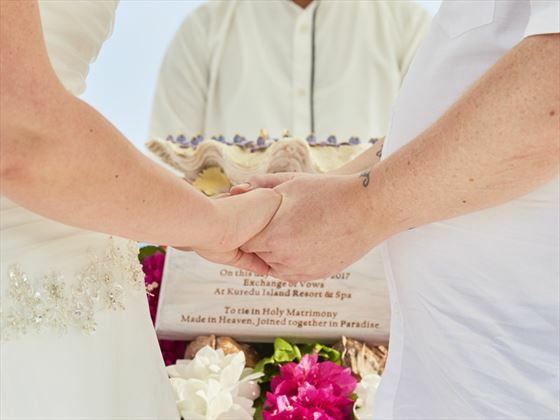 "We decided to renew our vows in the Maldives. We always wanted to go back so what better way than to go back and get married there at the same time. We read reviews for the Island and Resort and went with that!" "Just wanted to thank the both of you for all your help. The holiday and wedding was amazing. As you were so helpful and gave us an excellent price I thought I might continue using yourselves and your company. " 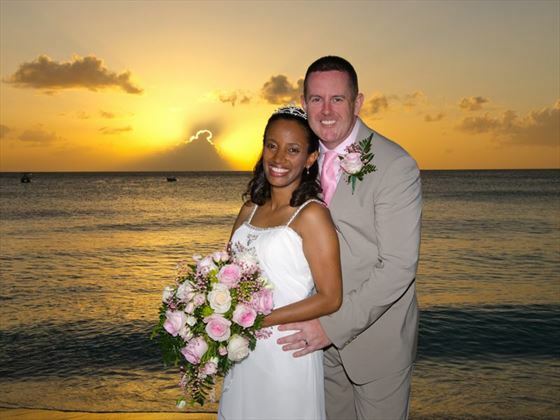 "Our Travel coordinator, Yvonne was so amazing. It was a rather large group and she handled everything so professionally and was always very friendly with us and all of our guests. " 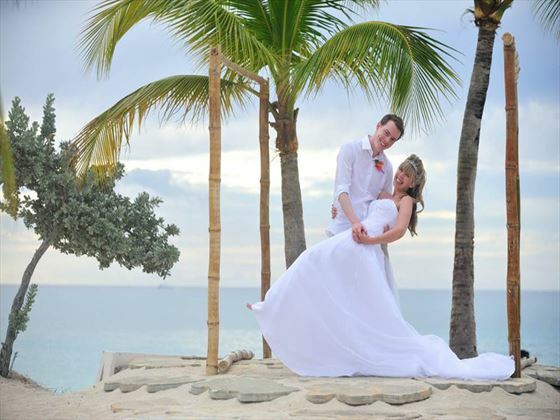 "I just wanted to say thank you for helping us with our booking! As promised a couple of pics from are special day!" "Tropical Sky were extremely helpful and efficient at all times. No query was too much trouble and they explained all details clearly and made the whole process straight forward." 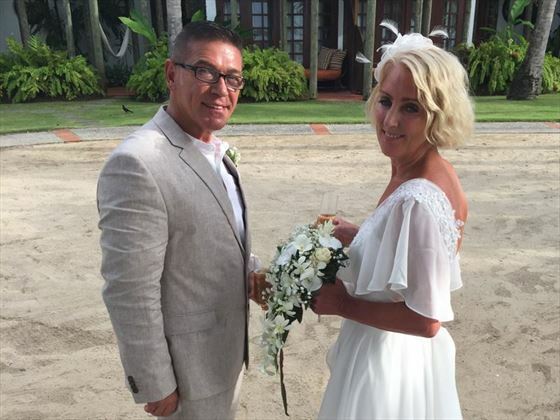 "We had an amazing & beautiful wedding at The Laguna Resort in Bali. Thanks Tropical Sky!" "Tropical Sky were fantastic. Really helped with any questions I had or plans that needed arranging." "My mum, who we could not have done this without, researched travel companies and came across Tropical Sky. Tropical Sky had a great reputation and specialise in weddings abroad. 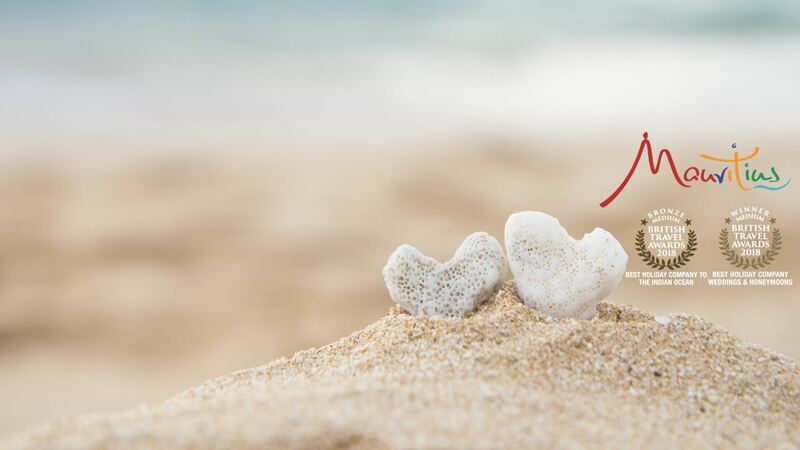 They offer Beachcomber hotels in lots of wonderful locations which only ever have one wedding per day so it really does feel like it’s your special day. " "The whole day was definitely my best ever memory I will never forget but it just seemed to pass so fast. But if I had to pin point for me it was the speeches. My father said some beautiful, touching words that will remain in my heart forever. My husband expressed for the first time his true feelings of true love and commitment to me. Then my brother in-law completely changed the atmosphere and read a hilarious speech. A brilliant end to such a fantastic, magical day." 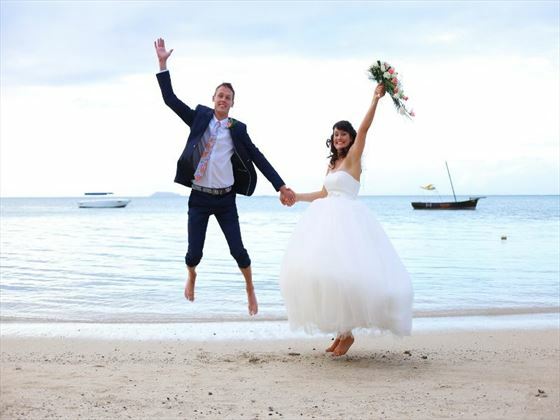 "We had an amazing time in st lucia, thanks again for your help with the booking x"
"Thank you for organising our beautiful wedding in Mauritius "
"We returned today from the most amazing holiday we have ever had. The way we were treated was beyond anything we could have wished for and our wedding coordinator Vanessa was an absolute star. I wanted to email you to thank you for your help and assistance with this trip. We have decided to go back next year with our daughters." "Here are just a few pics! You are sooo right! This place is wonderful! We are having the time of our lives. 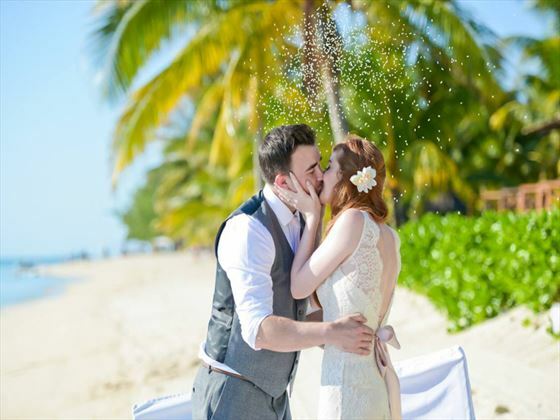 "As we had both been married previously, we wanted to get married where we both had not been before and Antigua just looked amazing… Tropical Sky were amazing from the UK through to their Resort wedding planner. " 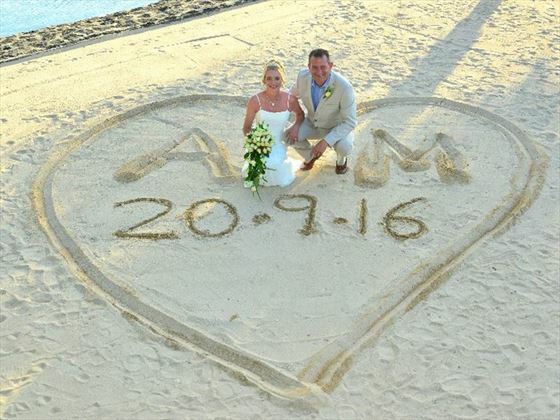 "Thanks to all your hard work in putting our magical wedding & honeymoon together, we would like to share a few of our memories with you. We could not have done this without you both and everything ran like clockwork, from the transport, to the hotel, to the staff, everything. A huge thank you from us both." 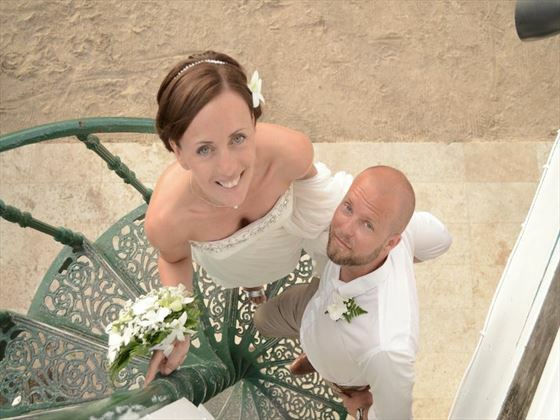 "The hotel and wedding were perfect. We couldn't have chosen a better place! Thank you"
Over the years, Tropical Sky has gained a reputation for providing the very best weddings abroad, with a vast selection of spectacular destinations and stunning resorts. Our team of dedicated wedding experts are on hand every step of the way to ensure that your dream wedding becomes a reality. 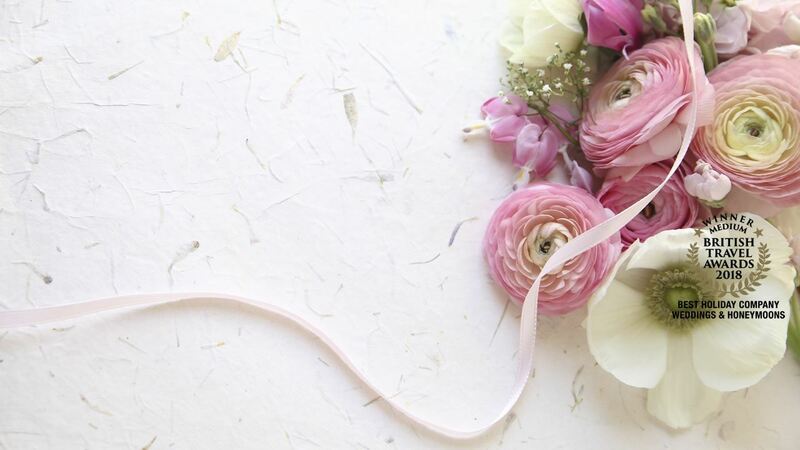 The cost of course is hugely relevant when planning your overseas wedding. 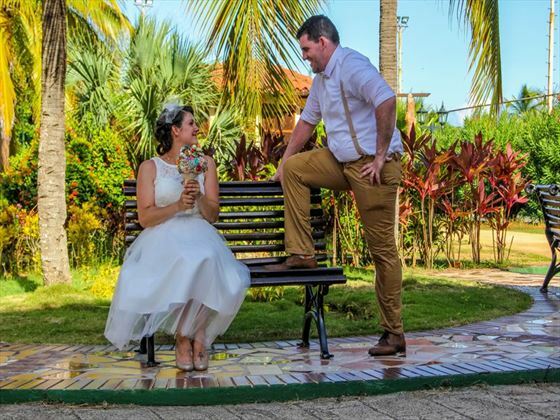 You want everything right and need any queries or worries answered, so choosing an experienced tour operator such as Tropical Sky that has dedicated staff to help you plan your wedding will ensure a hassle-free experience. 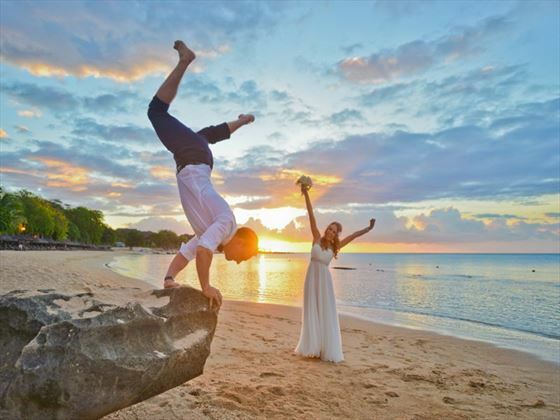 Whether you're seeking a breath taking beach wedding in St Lucia, a Thai ceremony that's rich in culture and tradition, or an intimate exchange of vows in the Maldives, we can help you create the wedding of your dreams.